Tonight we had Tia and Tio (Amanda and Chris) over for the movie and then games after the kids went to bed. Mickey thought we should start with a card game first since the kids weren't too keen on going to bed. (And when the boys play video games the girls are excluded.) 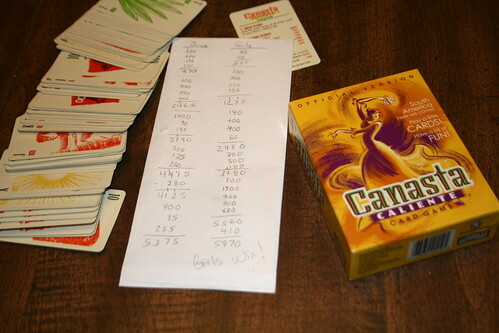 He pulled out Canasta Caliente. This is a game that we learned from the Mears. Sometimes it would get a little rowdy when we played with them. Right, Richard? Amanda and Chris had not played before so we started with a practice hand. The boys ended up getting a lot of points and instantly Chris is saying he really likes this game. That's how the first half of the game went. After the third hand of negative points I was ready to give up but us girls endured all the cockiness from the boys. Then the tides started to change. The girls came back with a vengeance. We got to stick them with all their cards in one hand. It was interesting to see how the boys' attitudes changed along with their luck. It came down to the last hand to see who was going to win. Let's just say that we had over half the cards laid out before the boys could lay a single thing. Here's the picture to prove we won. Girls Rule, Boys Drool! :) Way to go girls!! Our canasta cards have been sitting in the box for too long. . . probably because things certainly do tend to get a little "rowdy" when we break them out! But I think it may be about time. Wish we could play with you guys again! Easy with the trash talking Mrs. Mear! We might have to start banning people from leaving comments. :-) I could use a good rowdy game with Richard and you. That sounds like a lot of fun!